Home / Columnists/ The long-awaited MMDA report, a façade! The long-awaited MMDA report, a façade! After nine years of snail-paced deliberations, the Justice Saleem Marsoof (JSM) Committee Report to reform the Muslim Marriages and Divorce Act (MMDA), sometimes called the Muslim Personal Law (MPL), is out at last, bravo! The Chairperson of the committee, Justice Saleem Marsoof handed over a report to Minister of Foreign Employment and Minister of Justice Thalatha Athukorale on 22 January. It is regrettable that the JSM committee could not arrive at a consensus among the learned members who sat for a record nine long years. The report submitted by the Chairperson Justice Marsoof has already hit the fan with the majority in the MMDA committee disputing its validity. They claim that the Chairperson has submitted a report that did not include the recommendations of nine eminent members who signed off on their report and handed over to the chair on 21 December 2017, which has not been included as part of the main report as agreed but relegated to the last without any special mention of the process. It is also claimed that a non-member and two others who did not attend any meetings of the committee too have signed, which may invalidate the long-awaited report. They also complain that the Chair did not even have the courtesy to share his final report amongst or inform the committee before submitting it to the Minister. The Chair should have invited at least a few of members to take part in handing over the report to the Minister. After all, nine years of their valuable time was spent on this report that may now be relegated to the dusty shelves of the Justice Ministry. There are also accusations that the date and time of submission was leaked to some activists so that they could stage a protest outside the Justice Ministry to get maximum media coverage. A justifiable claim considering the fact that the activists lined up outside the ministry to protest during the time of the submission, while the committee was unaware. The nine eminent members who form the majority group in the MMDA committee include former Attorney General and current member of the Constitutional Council, Shibly Aziz PC, Faisz Musthapha PC, Abdul Salam, former Judge of the Civil Appellate High Court; Justice Mackie, Attorney-at-Law Fazlet Shahabdeen, President of the Jamiathul Ulema; Ash Sheikh Rizwe Mufthi, Secretary of the Jamiathul Ulema; Ash Sheikh M.M. Mubarak, former Director of Jamiah Naleemia; Dr. M.A.M. Shukri and the former Chairman of the Quazi Board of Review and Attorney-at-Law Nadvi Bahudeen. The long delay in the report seeing the light of day was mainly due to the Committee being divided as two groups – one that had the majority of the members claiming to take a stand based on Islamic principles while adapting to modern realities, and the other claiming to take a position of a rights based approach while being within the principles of Islam; the Chair miserably failed to negotiate a consensus. The delay in submitting the JSM report prompted former Justice Minister Wijeyadasa Rajapaksa to propose to the then Cabinet the need to amend the MMDA Act urgently as some provisions in the Muslim Law including the lack of a minimum age for marriage did not conform to the norms stipulated in certain international conventions. A Cabinet sub-committee was thus appointed in October 2016 but that Committee decided to wait for the JSM report before taking any further action. Rights groups, including Muslim and other women activists claim that some sections of Act 16 (1) of the Constitution which governs Muslim personal law is a violation of basic human rights of women while the majority in the Muslim community insist that it adheres to their religious rights and obligations. They also accuse the Chair of taking the side of the minority group within the Committee without being an independent mediator. Justice Saleem Marsoof who has done extensive research in to Islamic jurisprudence explains the Muslim Marriage and Divorce Act (MMDA) in his paper ‘Insights into Sri Lankan Family Law’. The current MMDA in Sri Lanka exists after going through several modifications and reviews from the Muhammedan Code of 1806 to what is now called the MMDA of 1951. The Muhammedan Code originally was brought to Sri Lanka from the current-day Indonesia that was established during the Dutch rule in 1770 and has prevailed since then. The Sri Lankan Parliament first enacted the Muslim Marriage and Divorce Act (MMDA) in 1951 to govern the Muslims of Sri Lanka. This law has been amended a few times to fill in procedural shortcomings. During the last 30 years, Muslim women activists have been demanding amendments to the act, which they claim discriminates against Muslim women. In 2009 the then Minister of Justice Milinda Moragoda after having extensive discussions with several eminent Muslims, acknowledged that certain reforms to the Muslim Personal Law was urgently needed. He obtained Cabinet approval to set up a 16-member committee consisting of senior legal personalities, heads of the All Ceylon Jamiyatul Ulema (ACJU), lawyers, and academics and members of civil society organisations. The letter appointing this committee has also been attached to the said report. The JSM Committee was headed by Justice Saleem Marsoof, a respected Judge of the Supreme Court to “Consider and Propose Reforms to the Muslim Matrimonial Law and Upgrading of Quazi Courts in Sri Lanka”. The JSM Committee appointed by Milinda Moragoda comprised of Justice Saleem Marsoof PC (Chairperson), Justice Abdul Salam, former Judge of the Civil Appellate High Court; Justice Mackie Mohamed, former Attorney General and current member of the Constitutional Council Shibly Aziz PC, Faisz Mustapha P.C, Deshabandu Jezima Ismail, President of the Jamiathul Ulema; Ash Sheikh Rizwe Mufthi, former Dean of the Law Faculty of the University of Colombo; Prof. Sharya Scharenguivel, Attorney-at-Law Razmara Abdeen, Attorney-at-Law Safana Gul Begum, Attorney-at-Law Fazlet Shahabdeen, Secretary of the Jamiathul Ulema; Ash Sheikh M.M. Mubarak, Member of the Mediation Commission; F.B. Juranpathy, former Director of Jamiah Naleemia; Dr. M.A.M. Shukri and the then Chairman of the Quazi Board of Review Nadvi Bahudeen. Dilhara Amerasinghe acted as the Secretary to the Commission. The Committee sat through the deliberations for nine long years, and has sent out a report that has no consensus among the 16-member committee. This could lead to major conflict between the activists and the majority of the Muslim community on the MMDA. One report has been signed by a majority of nine and delivered to the Chair on 21 December 2017 which the Chairperson and the activists do not agree with, and hence have submitted their own report. On the other hand, the majority group claims that there are certain provisions proposed by the dissenting group, which could be in contradiction with Sharia that is followed by Muslims. This is a debatable question as many Islamic countries have changed their laws in recent times and issued fatwas that may or may not be compliant with the Muslim Marriage and Divorce Act as practiced presently in Sri Lanka. The activists and the minority group within the Committee claim that Justice Marsoof has extensive knowledge and has researched on Muslim Marriages and Divorce Acts across the world, while the majority feel that he has been made a pawn in the hands of the activists. They also claim that the Chair has not acted as an independent Chairperson and hence divided the Committee, which has resulted in two reports. The majority group that includes the All Ceylon Jamiathul Ulema (ACJU) has come under severe criticism in recent times for promoting archaic and rigid interpretations of Islamic practice as claimed by some Activists. They have managed to garner wide media attention against ACJU, which painted these Muslim religious leaders in Sri Lanka as medieval thinkers and extremists. The majority of Muslims feel that the stand taken by these religious leaders is based on divine law and cannot be changed on the whims and fancies of ‘modern Muslims’. The Muslim Marriage and Divorce Act deals with personal laws concerning the Muslim community in Sri Lanka. Article 16 (1) of the Sri Lankan Constitution states: “All existing written law and unwritten law shall be valid and operative notwithstanding any inconsistency with the preceding provisions of this Chapter,” thereby diluting the supremacy of the Constitution by allowing the Muslim Personal Law to supersede it. The General Marriage and Registration Ordinance (GMRO) clearly states that Muslims cannot marry under any other law except the Muslim Marriage and Divorce Act (MMDA). The MMDA reigns supreme where Muslims are concerned, despite the Constitution’s existence. It simply means that a Muslim’s marriage would be illegal and could be annulled if they married outside the MMDA. The 1907 Sri Lankan General Marriage Registration Ordinance (GMRO) is applicable to all citizens of the country with the exception of Muslims who marry within their faith. Two communities – the Kandyan Sinhalese and Sri Lankan Muslims have separate Acts for marriage and divorce, on the basis of ethnicity and religion respectively. The present Muslim Marriage and Divorce Act (MMDA) was enacted in 1951. Kandyan Sinhalese too have the option of marrying under the 1952 Kandyan Marriage and Divorce Act as well as the GMRO. However this option does not extend to Muslims as only the Muslim Marriage and Divorce Act of 1951 (MMDA) governs Muslims who marry another Muslim (including reverts to Islam). Muslims however are allowed to marry partners who are of a different ethnicity or religion under the GMRO. If reforms to the MMDA would mean that the fundamental rights of Muslim citizens would be protected and not violated, then Article 16(1) should not be such a major concern. 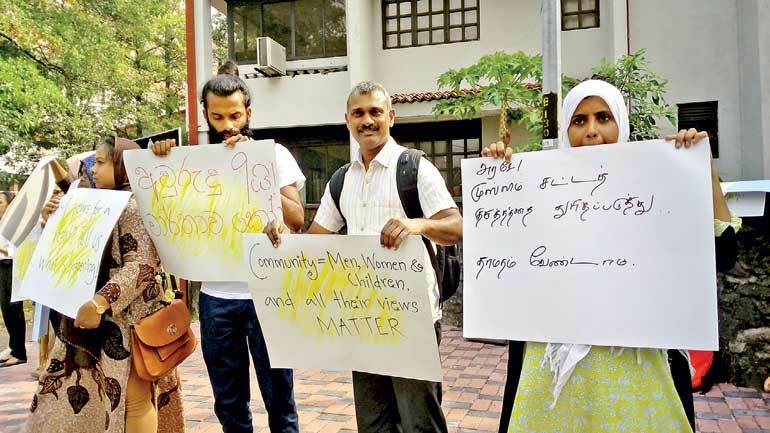 Only in the event discriminatory provisions contribute to be present – the absence of Article 16(1) is seen as an alternative legal remedy to address issues faced by Muslim women, men and children in matters of marriage and divorce through civil courts like any other Sri Lankan citizen. Muslims have faced the wrath of some Buddhist extremists during the last decade that led to the majority of them voting against Mahinda Rajapaksa, who was seen as providing impunity to the Bodu Bala Sena. Any attempt by the current Government to repeal 16 (A) of the Constitution or amend it without the consent of the majority in the MMDA committee would be seen as trespassing on the rights of the Muslims. Like Wimal Weerawansa’s constant claim of “international conspiracy”, the Muslims feel that this is a conspiracy hatched by the Government to please Geneva. It is a sad fact that after nine long years for this much-awaited report, the Muslim community continues to be divided even on issues that govern them. The Muslim Personal Law that the Muslims have enjoyed under section 16 (1) of the Constitution has become yet another dividing factor, where there have been calls by some activists to repeal it. The Minister of Justice would do well to summon the entire committee and inquire in to the dispute prior to submitting it to the Cabinet sub-committee that was appointed in October 2016. This committee needs to consider the submissions of the majority group of the JSM Committee so that the Muslims could amend the laws that govern them while adhering to their religious rights and practices.